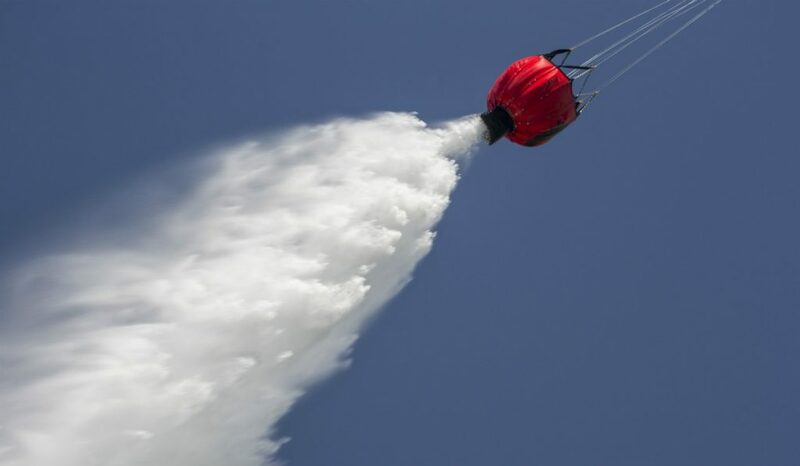 More than a month ago, DART’s new firefighting bucket – as its first such entry into this sector – was delivered to Guardian Helicopters for a second phase of testing, described by the company as real-life testing. DART states this testing phase exceeded expectations as its team of engineers put the bucket through a variety of rugged flight conditions. Testing included functionality checks in damaged conditions, in-flight stability assessments, simulated bucket maneuvers and a large number of drops in forward flight and banked turns. As the bucket flew at speed, the accuracy of the drops was also assessed. “We found it important for us to simulate real-world working conditions to test out the bucket. Not only did we test its functionality but made sure to prove its reliability,” said Pablo Bravo, director of engineering at DART’s San Diego facility. Phillip DiFiore, president of Guardian Helicopters, added, “Our test pilot was impressed that even with the removal of parts to try and disable the bucket, it continued to be stable in flight, had no issues picking up and dumping water as before.” The full menu of in-house tests for the new bucket included: Operability testing, working environment testing, component structural testing, endurance vibration testing, and control head cycle testing. DART’s firefighting bucket was introduced at the end of February at the 2018 Heli-Expo show. At that time, only a mock-up of the 320-gallon bucket had been built. Multiple prototypes were built and tested at DART’s San Diego facility, which includes testing pools and fabric tooling that have been used for DART flotation systems. In late June, production of the bucket began to fulfill what DART describes as a strong order backlog. The next available bucket delivery is scheduled for August 2018. “This bucket is not only a great complement to DART baskets, long lines and remote hooks, but one that is rightly priced, and compatible with what’s existing on the market,” concluded Bravo.